Upcoming PS Vita game intended for adult Digimon fans. Namco Bandai has shared new details and screenshots surrounding Digimon Story: Cyber Sleuth, its upcoming PS Vita Digimon game due out in 2015. Over seven years have passed since the start of the Digimon Story series, and fans who were elementary school students at the time have become adults. So, together with the game concept of the Digimon series, which includes adventure, training, and battle, this game sees a full scale renewal on visuals and world outlook, and might also interest fans who’ve never played a Digimon game. 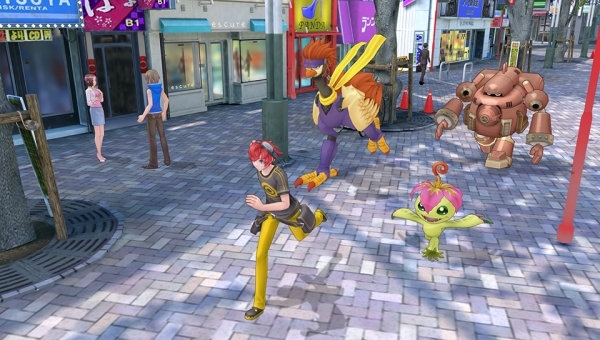 Digimon Story: Cyber Sleuth is a cyberpunk training RPG where players are tasked with investigating mysterious incidents occurring in the real world and cyberspace. Become a detective and solve incidents occurring in the real world and cyberspace, while using your Digimon to fight in battles. Training – Simultaneously train multiple Digimon. Collect a large number of Digimon, train and evolve them, and assemble the strongest team. The way that your Digimon end up evolving is dependent on how you raise them. Battle – Battle against the strongest Digimon via the “Wait Turn” battle system. Bring together Digimon of various sizes and challenge the fight. Enticed by rumors of the hackers, and following the rumors about Digimon appearing, our hero obtains a “Digimon Capture” device from someone he met on the net and logs into the lowest layer of cyberspace. However, because of a sudden malfunction in the system, part of his mental data is corrupted, resulting in his body being half-digitized. And at the same time, data from the cyberspace begins materializing in the city, and a strange phenomenon begins. Mysterious incidents will often occur in the town. Having gained a “Data Body,” the protagonist can freely travel into cyberspace via Terminal locations by making use of his special “Connect Jump” ability. Pursue the criminals and expose the truth behind the incidents.